The last time you heard about chlorophyll might have been on a list of vocabulary terms in your 8th grade science class, but this green pigment found in plant and algae cells has recently made its way into your local health and nutrition stores as a supplement. Crucial to plant’s photosynthesis process, chlorophyll helps to convert sunlight into energy. It works within the electromagnetic spectrum, absorbing blue, then red light most efficiently. However, it’s a poor absorber of the green and yellow end of the spectrum, which explains its deep green pigmentation. Okay, that’s your science lesson for the day. So what does chlorophyll mean for you? Medically, chlorophyll is used orally to deodorize the body from the inside out, specifically relating to bad breath and colostomy odors. It’s also administered intravenously to patients in hospitals in order to reduce pain related to chronic relapsing pancreatitis. But what about the chlorophyll supplements found in the vitamin section at your health store? Like most supplements, the Food & Drug Administration has not evaluated them, so you have to take their claims at face value. 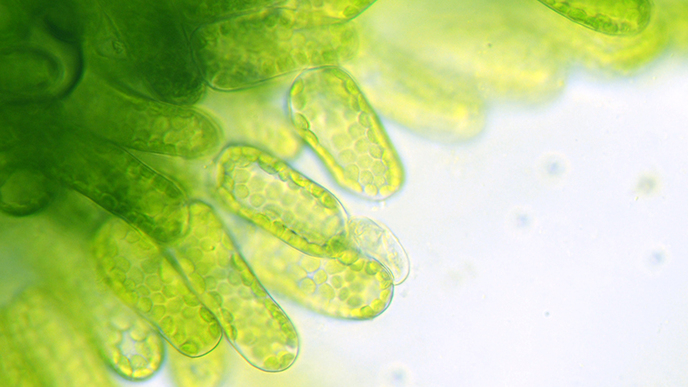 Chlorophyll can be dispensed in a liquid or a capsule form, and most often is derived exclusively from the alfalfa plant. Purported benefits include cleansing, oxygenating and boosting the circulatory system, detoxification, and colon cleansing. It can also help speed wound healing and alleviate constipation. The liquid supplement comes in a highly concentrated, dark green formula and should be diluted in a glass of water. Otherwise, you risk staining your mouth, teeth, and tongue. Capsules may be an easier option to swallow. There are also chewable mint varieties. Of course, chlorophyll occurs naturally in the leafy greens that we ingest in salads and juices. And this may be the best way to get a healthy dose of the plant molecule. Whenever you’re enjoying greens like wheatgrass, kale, arugula, swiss chard, sprouts or blue-green algae, like spirulina and chlorella, you’re getting a healthy dose of chlorophyll.